Amid growing concerns of plastic waste around the world, one company has created sustainable hair ties that are better for the environment. Made from organic materials like cotton and rubber, Kooshoo has come up with the world’s first plastic-free hair ties that are completely biodegradable. These hair ties come in a variety of colors and styles and are made with sustainability in mind — from the way the materials are sourced to how the products are manufactured. Jesse and Rachel, a couple based out of Victoria, Canada, founded Kooshoo. The two, who made a name for themselves as yoga teachers, built the company from the ground up. Their goal was to create a business model with sustainability in mind. They are also hoping to lead the change in the fashion industry when it comes to eliminating plastics in clothing. With its core values being love, honesty and transparency, Kooshoo is well on its way to meeting its sustainability goals. Given that more than 20,000 pounds of hair-related products end up in the trash each day, Kooshoo’s mission is important in preserving the future of our planet. People around the world lose hair ties on a daily basis. 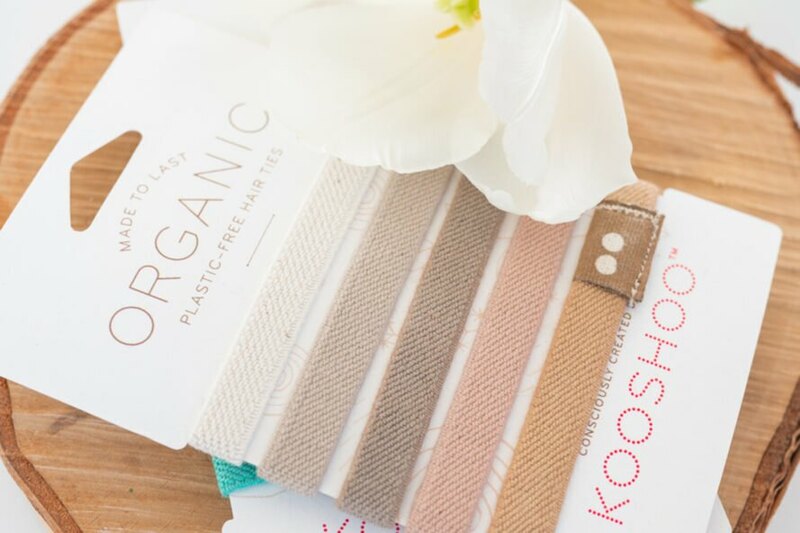 Most of these elastics end up in the trash or litter the environment, which is why it is important that Kooshoo hair ties are completely biodegradable. 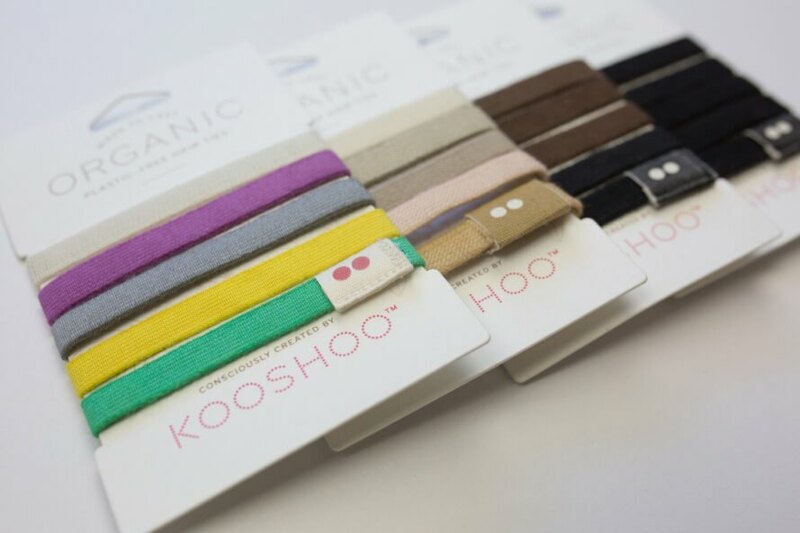 Kooshoo hair ties only contain two ingredients: natural rubber and organic cotton. This includes the thread that is used to keep the ties together. Each and every product is also certified by the GOTS, or better known as the Global Organic Textile Standard. 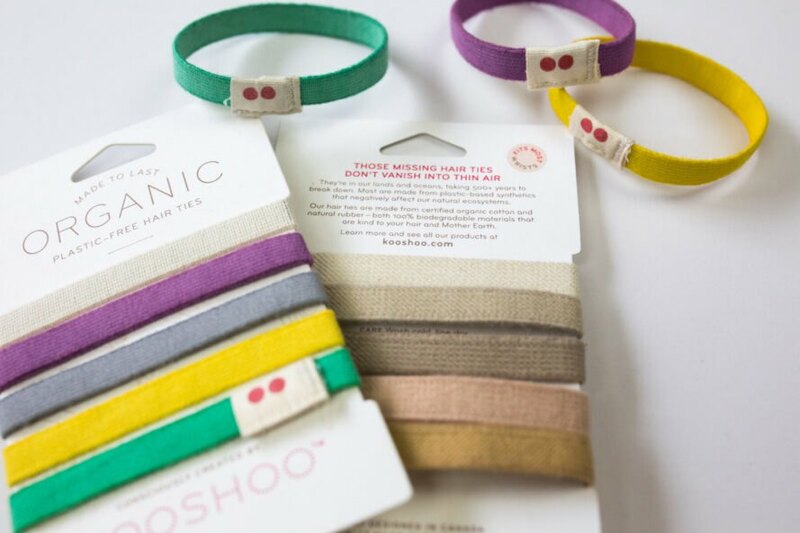 According to Kooshoo, all of the materials used in its hair ties are sourced from organic cotton. There are absolutely zero synthetics in the products, and the cotton is grown without the use of toxic pesticides. Not only is the end result better for the environment, but it is also beneficial to your skin. Each hair tie is manufactured in California, though all of the design work and testing is done in Canada. The materials are sent to local shops in Los Angeles, where workers cut, weave, sew and dye the ties before distributing them around the world. Kooshoo hand dyes all of its hair ties. The company employs a crew of artisans that are specially trained in dying textiles, which also means that each product is unique. How fast do the hair ties biodegrade? The rate of degradation depends on how the hair ties are disposed. If the ties are put in a compost pile, then the organic materials — which make up about 75 percent of the product — will start to degrade in less than one year. In fact, microorganisms in the environment will feed on these organics until there is basically nothing left. The other 25 percent of the product is the natural rubber. This material is drawn from trees in a similar way as maple syrup. It does take a bit longer to biodegrade, though organisms will eventually eliminate it in anywhere from three to seven years. Compared to traditional hair ties that contain plastics, this is much more sustainable. Even if you were to lose the hair tie in water, it will still break down completely. According to a recent article published by Kooshoo, it takes about double the time for its hair ties to completely biodegrade in water. Scientists estimate that these sustainable hair ties take about 14 years to break down in water conditions, but once they biodegrade, they leave absolutely no trace. What other kind of products does it offer? The main selling item for the company is its twist headband. These organic head pieces come in a variety of colors and styles and are suitable for men, women and children alike. The company, of course, has an assortment of plastic-free hair ties that come in various color schemes, including black and brown, blonde, rainbow assorted and sea shepherd. These ties are secure enough for the thickest of hair, yet soft enough to remain gentle on the head. Kooshoo also offers a few clothing options, including a versatile shawl for women and children’s pants that grow as the kid grows. Kooshoo facilities feature dye houses that are completely powered by solar energy. The organization also packages its hair ties in reusable shipping containers and bags. These practices help curb carbon emissions and lessen the amount of waste that ends up in landfills — and ultimately oceans — across the globe. For the people who own and operate Kooshoo, selling hair ties is not only about making money. The business has also donated a portion of its profits, along with some of its products, to charitable organizations. For instance, the establishment initiated a fitness and wellness plan for people in marginalized communities. More than 1,000 individuals in these communities were given access to meditation courses and yoga classes. Jesse and Rachel of Victoria, Canada are the founders of Kooshoo, which makes the world's first plastic-free hair ties. The company is focused on transparency and sustainability. These hair ties are made from organic cotton and natural rubber. The hair accessories come in a variety of colors. The company is also focused on powering its production with clean energy and giving back to the community.